By Justin C, ILCD editorGlobal warmers are down to the lunatic fringe. Most normal people now realize that “Global Warming” and climate changes are as natural as a sunny day, and that there has been no global warming for over a decade, and that carbon dioxide is not a cause. Just one-out-of-three voters (34%) now believe global warming is caused by human activity, the lowest finding yet in Rasmussen Reports national surveying. However, a plurality (48%) of the Political Class believes humans are to blame. Forty-eight percent (48%) of all likely voters attribute climate change to long-term planetary trends, while seven percent (7%) blame some other reason. Eleven percent (11%) aren’t sure. These numbers reflect a reversal from a year ago when 47% blamed human activity while 34% said long-term planetary trends. That is a shift of a whopping 14% in one year. Each year it shifts even more. Soon there will be nobody left believing it except possibly David Suzuki in his psychiatric hospital. Unfortunately, the US President and Congress are card-carrying members of the Global Warming Hoax Club and the US economy is about to be decimated with a Cap and Trade tax designed to reduce a planetary condition we didn’t cause and one that we can’t change. The media still champions their doom-and-gloom hysteria but now that it’s apparent we aren’t warming they have had to come up with something new and are beginning to claim that CO2 is “acidifying oceans”, another huge scam, but it’s clearly not working as intended. Even Al Gore’s $300 million advertising campaign to push his anti-carbon campaign (and increase his carbon credit profits) on the public hasn’t worked. People are not as dumb as Gore and Greenpeace once thought, just like people weren’t dumb and ultimately didn’t fall for all the “global cooling” propaganda of the 1970’s. This latest report is just one of many polls done over the last few months which all say the same thing: Unnatural climate change is a total scam and ranks at the very bottom of people’s priority lists. Sanity is clearly prevailing for a change, and this poll fits right in line with the overwhelming scientific opinion that man-made climate change simply does not exist and never has. As anyone who does their own research knows, there are far more scientists who do not agree with Al Gore’s theory compared to those few government-funded pseudo-scientists who support it. Consensus? What consensus? Give me a break. The climate change hoax and the fraudulent IPCC are finally being realized for what they are by the majority of ordinary citizens, as well as the majority of scientists. As we all know, only 26 IPCC members authored and approved their last scary report, and none of the UN scientists were asked if they agreed and many stated they did not agree. That’s called censorship, not science. In contrast, all 31,000 of the scientists who signed this statement against the IPCC and Al Gore have agreed with every single word of the petition, which clearly states the global warming theory is totally flawed. That one petition is about 29,000 more scientists than the IPCC even has on their payroll! And there are many other petitions all stating the same thing. And let’s not forget that just recently over 700 more scientists publicly spoke out against Al Gore’s claims at the US Senate. The idea that humans cause any type of global climate change and that a harmless trace gas like CO2 even could cause climate change is now only a myth and a religion held by anti-human environmentalists and population reduction advocates who either WANT to desperately believe it or simply want the people to believe it to further their agendas. No wonder the media reporting and greens have gotten more extreme these days. They have to shout louder and louder when they have no science on their side and the Earth continues to cool while ice caps and glaciers continue to grow around the world. In fact, as of March 2009 the ice concentration and thickness in Antarctica is more than 40% larger compared to 30 years ago, yet all you hear about on the news is that a tiny 7% portion of Arctic ice melted away (just like every spring at this time). Run for the hills! Politicians and enviro cults who support and push the global warming theory have to become more extreme and ignore all the scientists and the petitions because, after all, with the planet still cooling and destined to keep cooling for many years according to most meteorologists and climatologists, the window of opportunity to tax carbon emissions is shrinking. Cha-ching!It’s very encouraging to see that people are waking up to this hoax en masse. The notion of taxing carbon — the basis of all life and a vital plant food — has got to be one of the stupidest ideas in human history…but then again, it’s all about the money, eh? That’s quite a convenient truth, I’d say.As one commentator put it, spending money on man-made global warming makes as much sense as sacrificing virgins to a volcano to ensure good crops. Furthermore, mankinds influence on the climate is about as significant as someone sneezing in a hurricane. 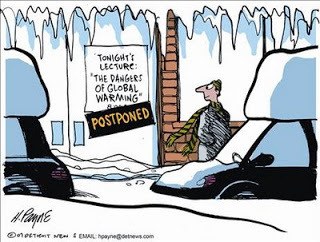 . . .the eco-religion of Algore called catastrophic anthropogenic global warming. It's the people in Congress — read: Demockacrats/Dementocrats plus some RINOs and CINOs (conservatives in name only) — and the enviro-wackos who stuff their coffers with money that count most right now. That may be mainly because they have ears for nothing that contradicts them. And they have the advocacy/adversary media and its numbnuts so-called journalists who know nothing about science and engineering, nor do they possess objective bones in their bodies. Plus there are some regulators at EPA and states agencies that are absolutely salivating about something else to absurdly try to regulate. We all know carbon dioxide is not a pollutant. It's a naturally occurring, beneficial trace gas in the atmosphere. For the past few million years, the Earth has existed in a state of relative carbon dioxide starvation compared with earlier periods. There is no empirical evidence that levels double, triple or 10 times those of today will be harmful, climatically or otherwise. But there is plenty of evidence which says more CO2 will be a great benefit to all life on the planet. As a vital element in plant photosynthesis, carbon dioxide is the basis of the planetary food chain – literally the staff of life. Its increase in the atmosphere leads mainly to the greening of the planet. Every honest scientists knows this, but the ones paid by the UN and media won't dare to admit it! To label carbon dioxide a "pollutant" is an abuse of language, logic and science. To actually believe humans can control the climate is simply arrogant. I can't believe anyone ever bought into Mr Gore's garbage! The statment, "CO2 is 'acidifying oceans', another huge scam," made me completely disregard anything said in this "article".